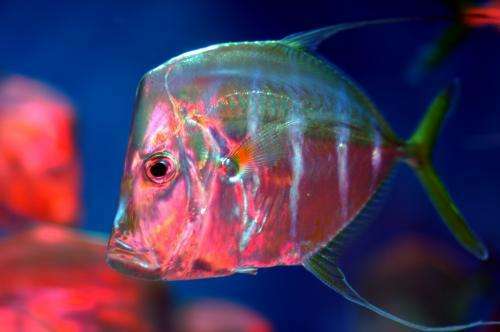 Researchers found that lookdown fish camouflage themselves through a complex manipulation of polarized light after it strikes the fish skin. This kind of camouflage outperforms by up to 80 percent the "mirror" strategy that was previously thought to be state-of-the-art in fish camouflage. Credit: By Jeff Kubina. Creative Commons. Some rights reserved. "From an evolutionary biologist viewpoint, I am always excited when evolution is one step ahead of humans," said Cummings. "There is this problem out there—how to blend in to this environment, and though we haven't quite solved it yet, an animal has. We can identify these basic biological strategies, and perhaps materials scientists can then translate them into useful products for society." "stealth fish". I like that better.